I love capturing intimate moments between the bride and groom, like in this photo captured at Crooked Willow Farms. I try not to get in the way as the photographer when I see the couple have a wonderful connection like these two did. I usually just direct them to walk to a spot with great light and backdrop, and then let things happen naturally from there. The groom got in behind her and gave his bride a big squeeze, and she responded by nuzzling into him. If I need to finesse the overall pose with a few instructions I will, but there is a balance between perfection and feeling genuine emotions in a shot. Because of the romantic feel I wanted to portray, I kept the background soft by using a shallow depth of field. Crooked Willow Farms is a versatile wedding venue located close to Denver with lots of ceremony and reception options to choose from, fitting up to about 200 guests. Locations include the Carriage House Ballroom, the Events Lawn, the Wine Room, Goose Park, the Courtyard (with pretty market lights) and Lola's Loft. There are bridal suites and a groom's lounge, so preparations can take place on site. 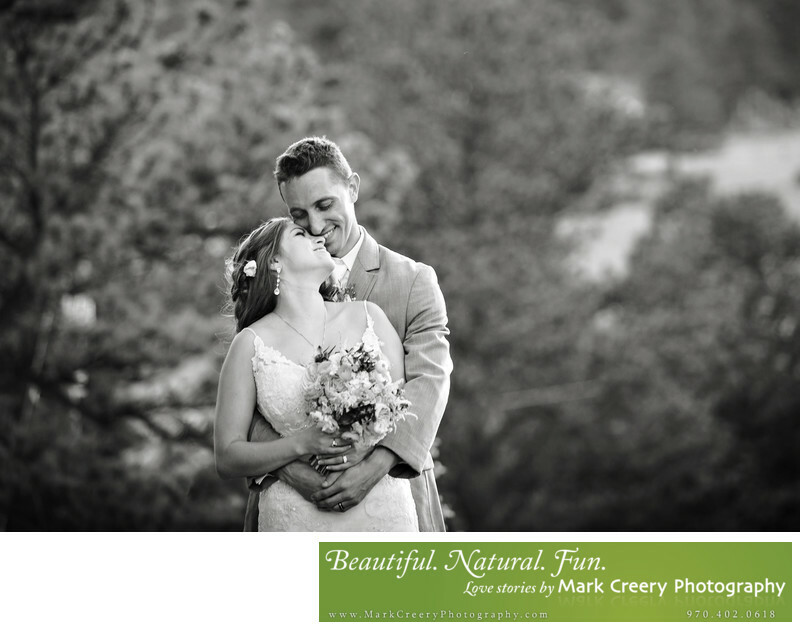 The Venue at Crooked Willow Farms is located in Larkspur, Colorado. Contact: (303) 951-8888, Info@CrookedWillowFarms.com. Location: 10554 South Perry Park Road Larkspur CO, 80118.